As the seasons change and we emerge from the winter doldrums, the appearance of feather dusters and rubber gloves signal the start of spring cleaning season. Furniture123 may not be able to help with the vacuum cleaner but they can offer a range of clever, space saving furniture to help keep the clutter in check for another year. The Oslo bed has a modern low slung design, with low-profile mahogany feet and a tall, loft style headboard. 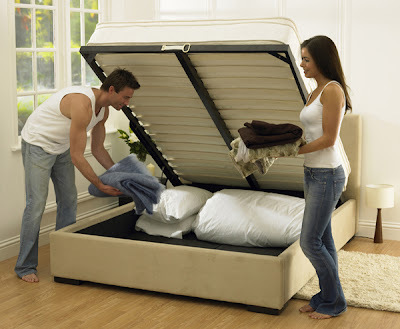 Not only is it great looking but the base has an easy-access, lift-up frame which reveals ample storage underneath the mattress, to keep the bedroom clutter free. The finishing touch is taupe faux suede upholstery, which makes the bed look ultra chic. 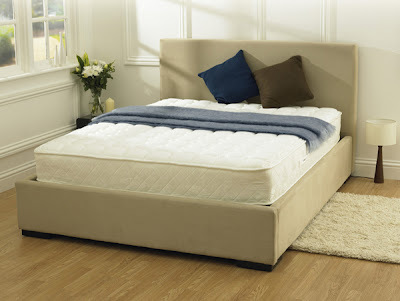 This bed also comes complete with a choice of mattress from the Body Impressions memory foam range. Bloxx is a stylish and versatile range for the home or small office. With mobile desks and storage units, Bloxx items can be combined to create the perfect working area then wheeled away to minimise the space they take up when not in use. All pieces have a chunky design and feature a durable beech laminate finish. Too many people walk straight through their hall without giving it a second thought, or use it as a dumping ground for anything and everything. 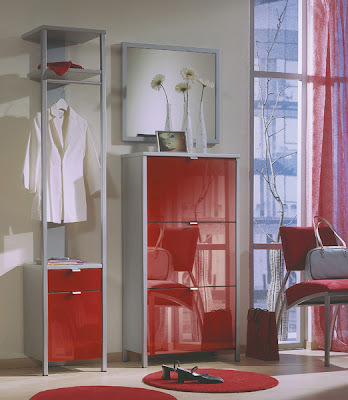 Strike a happy medium with the Prestige range of hall furniture. The tall cabinet will provide a home for twelve pairs of shoes, while the clothes stand offers space for jackets and bags, as well a handy drawer and cupboard. As the UK's largest online-only furniture retailer, you will find a fantastic selection of items for every room in the house, as well as the garden, all accessible from the comfort of your own home. Furniture123.co.uk offers free delivery on all items to mainland UK. The 7 day money-back guarantee ensures that customers are able to receive a full refund if they are unhappy with their purchase.